Bryony and Jamie discovered that they share a family member, but only because a relative spotted them on the same page of our Down2Earth magazine! The pair both featured on pages 6 and 7 of the magazine, which is produced twice a year by the Down’s Syndrome Association for its members. The pair live more than 300 miles apart and had no idea that their mums shared a cousin until, after seeing their stories next to each other in the magazine, the pieces of the jigsaw were put together. Bryony, who lives in Morecambe in Lancashire and Jamie, who is from Dover in Kent, are both in their 20s. They both got in touch with Down2Earth back in early 2018. Both were pleased when they were featured in the September 2018 issue of the publication. Bryony had written about her ambition to be a journalist and Jamie’s story was about his progress since he had been featured in the magazine 25 years ago as a baby. The family connection came to light when Bryony’s mum Theresa had her cousin Linda to visit. Bryony proudly showed Linda her article in the magazine and Linda instantly recognised the face on the next page. It was Jamie, her (adopted) cousin Sue’s son! They could hardly believe the coincidence. Linda had been adopted by Sue’s aunt and uncle in the 1950s and had grown up in the family. She later decided to search for her birth family, connecting with Theresa, her blood cousin. Direct contact was made between the families via text message but the distance between their homes made getting together in person a challenge. 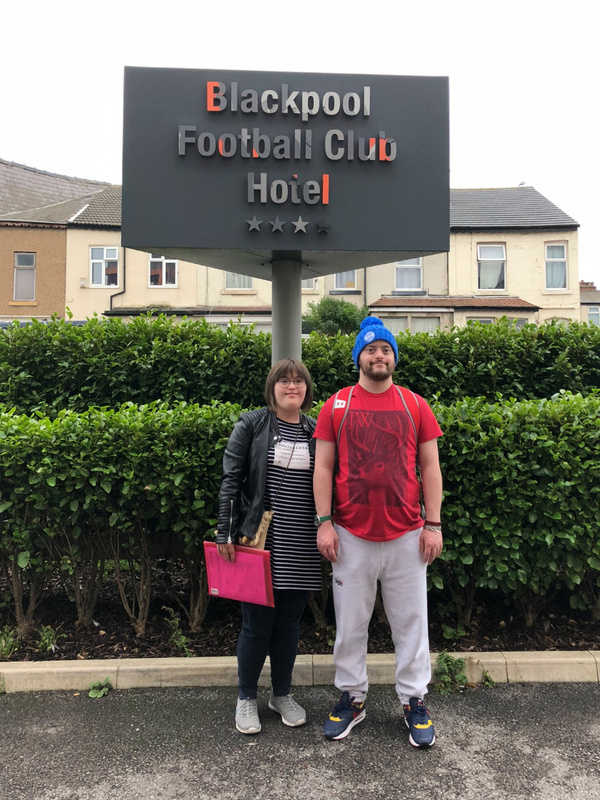 Sue and Jamie happened to be travelling back from a trip to Scotland when one text arrived though, and soon a plan was hatched – the two families would meet at The Blackpool Football Club, which was a treat that had been booked for Jamie’s birthday. Down2Earth is very pleased to have played its part in making such an amazing story happen! You can also send things in for the Down2Earth Editor’s blog. You can write about your life and what matters to you. Email info@downs-syndrome.org.uk if you would like to write for the blog.